Rob MacKenzie was born into a crofting family in central Glasgow. Ultimately central Glasgow proved not to be conducive to crofting and the family returned to the Hebrides, but not before Rob had spent 9 happy years running around Kelvingrove Art Gallery and Museum, which was right next to his family’s tenement flat. On returning to the Hebrides, Rob never quite lost his soft city ways, but he did at least complement them with plenty of fresh air and open spaces, so that, when looking for something to do with his growing interest in science he opted for Environmental Chemistry at Edinburgh. Edinburgh —Auld Reekie. Whilst at Edinburgh, Rob developed a fascination for experimental poetry of various kinds, and for much of the subsequent two decades he was able to combine his research career with forays into the poetry world, until typing at a computer screen all day finally “did for” his ability to turn a phrase. He was anthologised in Polygon’s 1994 collection of new Scottish poetry, _Dream State_, and his collection, _Off Ardglas_ (Invisible Books, 1997), is still available from all good bookshops that don’t throw out old stock. A major focus of Rob’s research has been the ozone layer. This work, much of which was carried out whilst Rob was Scientific Coordinator of the Centre for Atmospheric Science at the University of Cambridge, used observations to test models of the chemistry and physics of ozone depletion. Along with colleagues in Italy, Russia, and Germany, Rob was a founding member of the team that used a unique research aircraft — a Russian ex-spyplane called the Geophysica — which could carry scientific instruments to 20 km altitude (over 12 miles high). In the ten years from 1997, the Geophysica clocked-up over 500 flight hours, in twelve scientific campaigns across the world, from Arctic Finland to Tierra del Fuego via the Seychelles and Brazil. These were not usually relaxing tours of interesting holiday destinations, but were instead rather frantic attempts to guide a pilot who couldn’t speak much English into invisible clouds of microscopic acid droplets. The attempts at guidance were sometimes successful and led to — amongst many other things — the identification of a hitherto unobserved cloud, the Ultrathin Tropical Tropopause Cloud, which plays a significant role in determining the composition of air entering the ozone layer. Subsequently Rob has continued trying to beat military hardware into scientific ploughshares, particularly in respect of unmanned aerial vehicles (drones). He led a recent scoping study for the Natural Environment Research Council into the use of drones for Earth and environmental science and is part of the first UK team to make use of the Global Hawk, a very large drone which is the robot equivalent of the Geophysica. 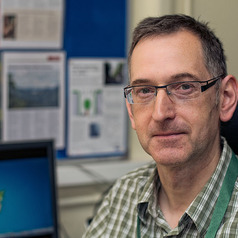 The other key aspect of Rob's research is how atmospheric composition is affected by the underlying land surface, especially the way in which these interactions affect pollution in cities.